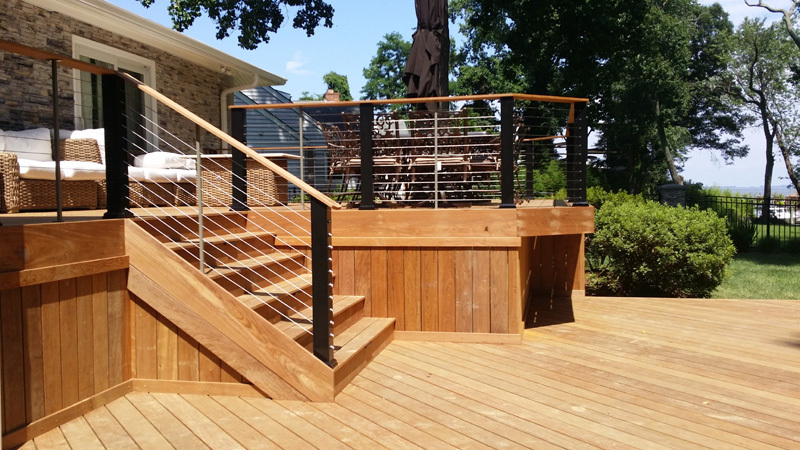 Who is the best deck company in Annapolis? Who is rated as the top deck builder? There are many deck contractors – how do you find the best? After a frustrating, bureaucratic, weeks-long design process culminating with an outlandish price for only 80% of what we wanted from a large landscaping company for our deck, patio, and landscape demo and redo, a friend had an intervention with us—told us to do more research and get additional quotes. We found Coastal Deck in a local flyer and they had good reviews so we called. Brandon (the owner) was here within a couple of days, listened to what we wanted, sent us a design the next day, modified it based on our feedback, and provided a much more reasonable quote for everything we wanted plus more. Work began soon thereafter and even though it was a large job, they were finished quickly. There were multiple crews specializing in the different trades (carpentry, stonework/masonry, landscaping) and they were all polite, professional, and responsive. Brandon was in communication with us almost daily and on site to coordinate the work and answer questions and address little issues that came up. This took a lot of the stress out of the construction process. The end product is glorious. We love our new deck and use our fireplace all the time. There is lighting integrated into the patio and landscaping and we’ve received lots of compliments from family and friends. We are very thankful that our friend pushed us to get more quotes and that we found Brandon. I knew the instant that I met Brandon (owner) that we would hit it off good. His ideas, professionalism, and work ethics are what sold me! The bonus was his crew are hard workers with quality in the forefront. We had two Ipe decks built with a beautiful cable rail one had a lower deck which they reinforced for our hot tub. 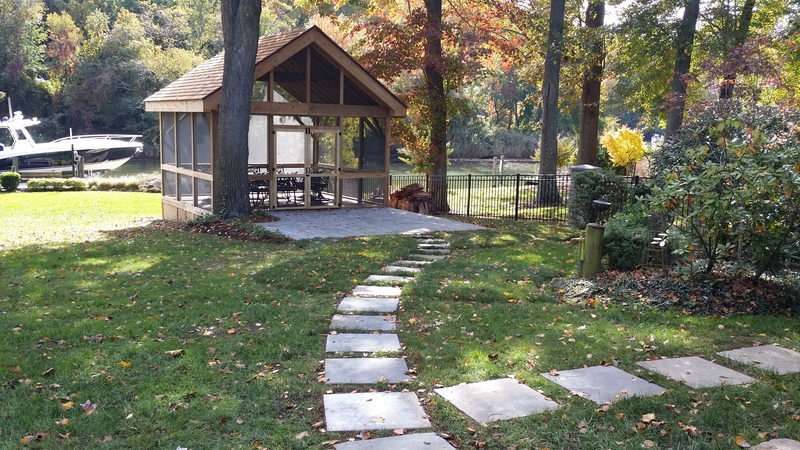 The gazebo is another beauty built with Ipe and cedar with a beautiful slate patio. They finished the project with a stone walled garden to match the house and boulders, river rock and healthy plantings. I couldn’t be happier with Coastal Deck and Fence and Coastal Outdoor! I highly recommend them to all my friends and family! We replaced our existing, two-tiered deck with a comparably-sized deck, adding a 16 x 19 ft. screened-in porch, and raising the entire deck to the same level. This upgraded deck, in essence, replaced our existing pressure-treated, wooden decking and rails with Ipe FIBERON decking and white vinyl rails and trim, respectively. In addition, we replaced our existing front porch entry-way pressure-treated, wooden decking and rails with Ipe FIBERON decking and white vinyl rails and trim, respectively. Finally, we replaced our existing pressure-treated, wooden privacy fence with a 6 ft. tall solid PVC fence conforming to the same dimensions as our existing privacy fence. We cannot even begin to describe what an enjoyable experience it was to work with Brandon and his crew of professionals! From the very beginning, Brandon and his crew were responsive to our every need and concern, from listening to our design requirements to implementing changes to our original plan. Only the highest quality materials were used, and the finest construction techniques employed. Furthermore, Brandon’s construction crew members were personable, courteous, outgoing individuals who were not only experts in every facet of their work, but went out of their way to ensure that we were satisfied with every detail. Brandon’s team also included electrical professionals who timely installed custom lighting, electrical outlets, and multiple outdoor ceiling fans in accordance with our wishes. No detail was too trivial, no request too burdensome for Brandon’s crew! A prime example of this was Brandon’s foreman, Misael, who went out of his way to match the replacement siding and deck roof shingles, EXACTLY, with the existing siding and shingles on our home. Needless to say, I highly recommend Coastal Deck & Fence for creatively designed decks and porches. If you are in the market for a building professional that is focused on your every need, and dedicated to completing the job on schedule and within budget, then Brandon and his team of professionals are the ones you want to hire! My husband and I contracted with Coastal (Brandon) to tear down our original 29 year old dilapidated deck and to build us a 12′ x 16′ screened in porch. At the same time, our neighbors were considering a tear down and new build of their deck. We, both, received estimates from three other contractors whose costs came in considerably higher than Brandon’s. We both contracted with Brandon and less than 2 weeks later, our deck and theirs was coming down. Needless to say, we are ecstatic with the porch Coastal built. Brandon drew us plans for the porch, got all of the permits, and helped us find an electrician. We chose to use composite decking, wrapped the wood with vinyl material so it needs no maintenance, and chose not to have a ceiling but to keep it open to the joists and beams, which makes the porch appear larger. We have four cats so we chose to use a pet resistant screening system so the cats can’t claw holes in the screen. Brandon’s work crew were always respectful and considerate to us and to our property. They are highly competent and experienced carpenters and I could tell they took great pride in their work. The three men started their day by 7:30 am, worked all day and left at 5 pm, and some days at 6. Brandon kept in touch with us by phone, email, and text throughout the entire process and was onsite several times a week. Both projects were completed by May 25 so it took a little over 2 weeks. Brandon is detail oriented and knew that if he didn’t like a material I wouldn’t like it either. I didn’t like the porch door but before i could tell him he had already purchased a new door which i liked much better. He didn’t like the LED lights that he originally ordered which were to be mounted on the inside of the porch so he found better quality lights which we like better and that coordinate with our furnishings. Lastly, the building inspector who finally approved the porch told us that he sees new porches all the time and our porch, built by Coastal, was far superior in materials used and workmanship than many that he has seen. Don’t second guess yourself when selecting a contractor to build your deck, your porch, your fence, or your patio…..contract with Coastal (Brandon) and you will be amazed with the high quality, amazingly beautiful finished product!!!! Brandon and his team are true professionals. Started the project on time and ended as planned, informed. Not one single negative to mention. Wish all contractor experiences were this easy and painless. Plan on using Coastal Deck & Fence for our next outdoor project. Coastal Deck & Fence built a beautiful 16 x 20 foot composite deck for us. Before choosing Coastal, we obtained 3 other estimates for this deck. Coastal was by far the most inexpensive quote received. We were VERY hesitant to go with the cheapest estimate as my mother always said, “You get what you pay for!” My mother was so wrong in this case. 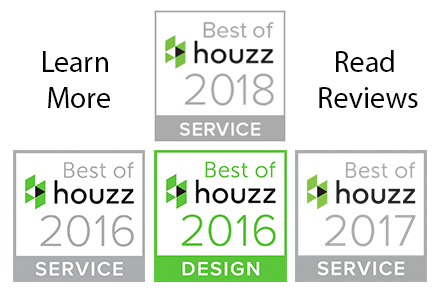 The men that built our deck were so proficient, detail oriented, and hard working that we were couldn’t be happier with their service and the result. This company was so intent in making us happy with their product that they went above & beyond what we felt they should do. The deck was finished within a week, with the crew even working on Sunday. The gentlemen who build the deck were very professional and respectful. By the way, this is the first review I have done for a company. I wanted to write this review as this company is really wonderful and I wanted others to know what a great experience it was for us AND what a beautiful deck we have. We hired Brandon at Coastal Deck and Fence to do the deck we wanted to have built at our house. He delivered as promised and went above and beyond as far a always communicating the progress for the permits and delivering a seamless product that my wife and I will enjoy for years to come. I’m truly glad to be able to have made this investment with such a great contractor. I will definitely be using Brandon for when I need to have my fence built. We are truly grateful to have been able to work with Brandon and can assure anyone out there, you wont be able to find someone that puts the time and efforts in to make sure the client is happy. Thanks again Brandon and can assure you, that we will be a repeat client! Brandon and his team did a great job on my deck. He completed the work in about one week for a very large space, and his crew worked through rain and very cold weather to complete a quality project. I would recommend Coastal Deck & Fence for any deck work. Well done! Coastal Deck and Fence did a wonderful job on our Edgewater home. The care and precision that Brandon Stewart took to assure the job was completed to our satisfaction was incredible. The workmanship and attention to detail will have us using the company for our future deck and fencing needs. The team of workers were able to work around the bad weather to complete our deck modification and lattice installation in a timely fashion. My husband and I requested Brandon’s assistance in determining the best way to replace our deck. We have a very large deck with multiple sections. Brandon’s knowledge, expertise and honesty made this a pleasurable experience for us. We felt very comfortable asking him questions on various materials, etc. He made several trips to our home and was more than accommodating. We loved working with him and would highly recommend him. He is a great man of integrity. My husband and I were looking for a a way to add shade to our pool deck that added to the beauty of our outdoor space. What we received from Coastal Deck and Fence was much more! Brandon Stewart and his crew designed and built a pergola that will allow us to use the space as an outdoor living room with room for seating and electricity for a tv set up. The quality and craftsmanship from Coastal Deck and Fence exceeds expectations. The carpenters were friendly and very clean. We can not wait to use our outside living room this summer! We recently had our 20 yr old wood deck refurbished with new vinyl flooring and railing. It turned out much better than we had imagined. Other companies tried to talk us into building a whole new deck, but Brandon assured us that it wasn’t necessary -and saved us a significant amount of money. We have already recommended Coastal- and Brandon- to several of our friends.